Trains run on Sundays in April. Happy Holiday Railway Santa Trains All Aboard for the North Pole! Happy Holiday Railway tickets for will go on sale on July 1st. Embark on a magical 40 minute train ride through the winter countryside with Santa Claus himself! Start a new Christmas tradition with your family this year!Days for this event are November 29th, 30th, December 1st, 7th, 8th, 14th, 15th, 20th, 21st, 22nd, and 23rd. Saturday and Sunday trips, and trips on Friday, November 29th, take place at 1:30pm, 2:30pm, 3:30pm, 5pm and 6pm. 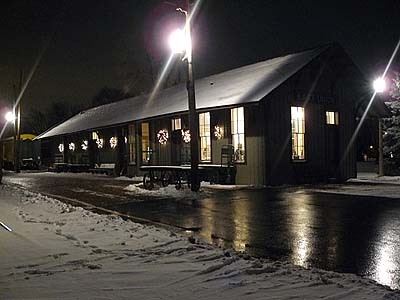 Trips on Friday, December 20th and Monday, December 23rd take place at 5pm and 6pm only. (Rides at other times on all dates may be added later based on demand). Plan to arrive 30 minutes before your scheduled trip.Ticket prices are $18.00 per person. Everyone past their first birthday must have a ticket. Tickets are non-refundable and non-transferable, all ticket sales are final. Most display buildings and portions of the museum grounds will not be open for this event. Parking is free. The train ride will leave from a platform at Barn 9 and return to the same platform, rather than the diner or depot. Santa will ride the train with you. Hot chocolate and cookies will be available on the train. Display Barns 6, 7, and 9 will be open. If you are unable to print your tickets at home, bring a copy of your order confirmation email to the museum store where you will check in for your ride. 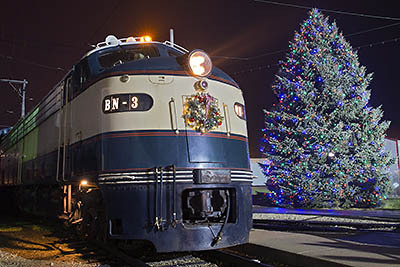 Join us for the most exciting holiday train in the greater Chicago area! All Aboard! All schedules and equipment subject to change without notice.